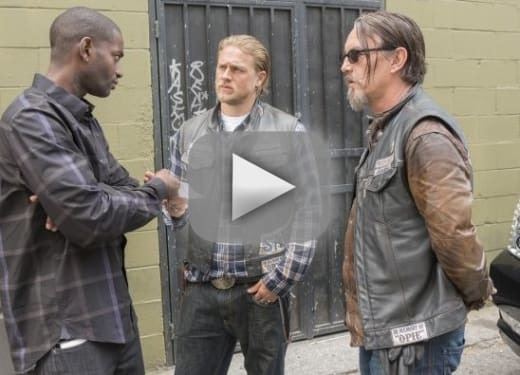 Jax sets Juice free on Sons of Anarchy Season 7 Episode 7 and allows him a chance at redemption. But in order to earn it Juice has to get himself arrested. Once in jail, his job is to find Lin and kill him with the help of Telly's crew. Back in Charming, Gemma is terrified as she wonders exactly what Juice told Jax and whether her son knows she was helping Juice escape or that she killed Tara. When Jax has Happy and Rat Boy pick up Gemma to bring her to the cabin to help out, she assumes the worst and packs a gun. Before she leaves she breaks down in tears and confesses to little Thomas that she killed his mommy but it was an awful accident. Little does she know that Abel overhears her entire conversation. Nero plans to sell out his share of Diosa and buy his uncle's farm. He asks Gemma to come with him. Initially she balks but when he says she can bring the boys and Nero comes close to tears, she agrees to think about it. Jax tries to uses leverage against August Marks but before he can deliver it, Marks' own security team run Bobby off the road. 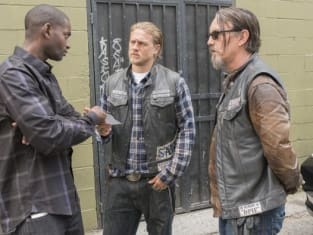 The security leader meets Jax and hands him a box with Bobby's SAMCRO patches and his eye inside. You need to watch Sons of Anarchy online here at TV Fanatic.